This was our third Day of the Dead in Oaxaca. The first was about twenty years ago when I came here on an accreditation visit for an American university with a graduate program here in the Oaxaca Valley. What I mostly remember is that Linda and I spent the night of November 1 in the Xoxocotlán cemetery watching families share meals and talk with their departed relatives. There was music playing. We recall a generally somber and mysterious mood and an unseasonalbly drenching rain. Muertos is a very distant cousin to Halloween. In Catholic Latin America it is one of two moments in the year when society looses its restrictions and gives itself over to excess. One of these moments, Carnival, comes in the spring just before the planting season in the northern hemisphere. The other, Muertos, comes just after the harvest. Both have a deep religious significance. Carnival is the blowout before the 40-days of abstinence and repentance that lead the faithful into Easter. Muertos is a memorial day, a day for families to honor their ancestors and commune with their family roots. Spirits of the deceased come to the cemeteries and expect to be visited by their surviving relatives. People erect home altars to their dead so that the spirits will visit them in their houses as well. Everyone knows that the spirits like to roam the streets, often in disguise, so it is safest for the living to be nice to everyone since they never know whom they might be talking to. Angelitos, sprits of children who have died before the age of intelligent conversation (say 3 years old), hover in the air. Theologically their deaths were joyous occasions; since they died before it was possible for them to sin, they ascended directly to Heaven. Nowhere Is Muertos celebrated more colorfully and more frenetically than in Mexico, with the celebrations in Oaxaca and Michoacán sharing the top honors. The governments of both states consider the festival an economic pump, and have poured resources into publicity and making sure there is an array of attractive events scheduled over several hotel-filling days. Last year Linda and I were living in the casita while our casa was under construction. On the 31st we participated in building a communal Muertos altar in the field adjacent to Jim and Kathy’s salad garden. On November 1 most of the action was in San Pablo’s cemetery. Every grave in the camposanto behind the San Pablo church was decked out in orange marigolds and bright red coxcombs, and San Pablo families brought pan de muertos and bottles of mescal to the cemetery to share with their loved ones. Linda and I didn’t get into the city much during Muertos last year, which was a shame, because all the businesses downtown sport Muertos altars, as did the churches and the government offices and the Zócalo. Every neighborhood, every school, and every communal organization fields a band and a parade. Oaxaca State and Oaxaca City hosts events (food fairs, a book fair, a feria de artisanía, art shows, concerts, dances, children’s activities – you name it). For a few pesos a street artist will paint your face to look like a corpse. People gather and are entertained in every possible urban venue and most of the street corners in the city. This year promised to be similar, ... except . . . now Santa Cruz was fielding two separate comparsas in addition to San Pablo’s. Venues had to be found, schedules worked out. Collaborations (e.g., contributions) sought. Everything was promised to be bigger and better than the previous year. This year November 1 fell on a Sunday, which meant that the holiday would prolong through Monday and Tuesday, with businesses and schools closed, and everyone cheerfully giving themselves to excess. Most of the traffic signals were out and no one seemed to be paying attention to them anyway. # Saturday the 31st, 9:00 AM at his farm to tie bouquets of flowers to deck the communal altar. 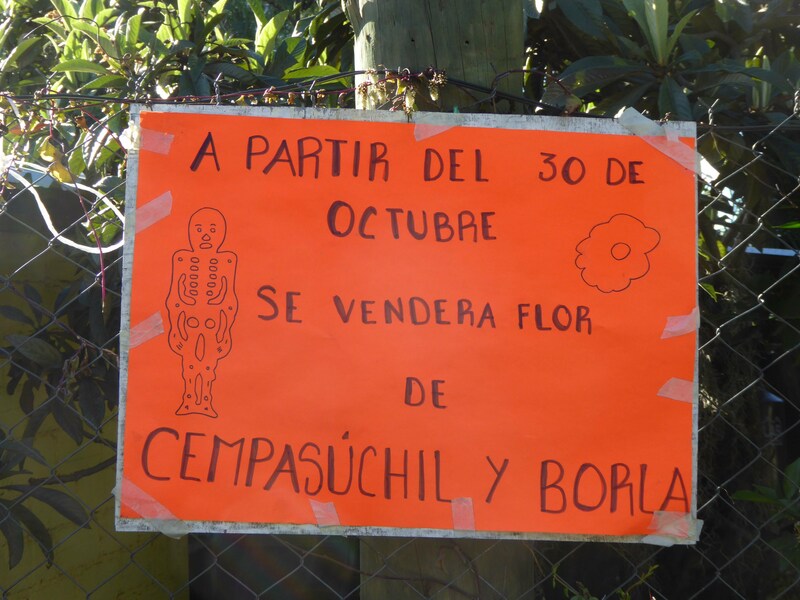 Please bring as many flowers as you can: big orange marigolds (cempasúchiles – [Tagetes erecta]), red-purple coxcombs (terciopelos [Celosia cristata]), tiny marigolds called flores de San Nicolás [Salvia officinalis], and sprays of diminutive white nubes [Gypsophola panicolata], all of which come into bloom conveniently during the last two weeks of October. # Sunday at 8:00 PM, the comparsa of San Pablo at his house. # Monday at 2:00 PM, one comparsa of Santa Cruz at his house. Pan de muertos and chocolate and tamales to follow for the clean-up crew. Lalo informed us of the supplementary schedule. His Santa Cruz comparsa would be coming to our house at 8:00 PM on Tuesday. No, you don’t have to do anything to prepare. But invite all your neighbors and friends. The hats had been passed among the expat community six weeks earlier: money for the bands, money for the drinks, and money for the bushels of cempasúchiles and terciopelos that would be needed beyond what experience had taught Jim the Saturday volunteers would bring. Unfortunately the orange-yellow flores de San Nicolás and the white nubes grow only in the wild, so the altar assemblers would have to make do with whatever the foragers had managed to glean. On my Friday birdwalk Qalba and I roamed the lomas north of Santa Cruz. I saw hardly any flores de San Nicolás among the thorn scrub and mesquite, but here and there the slopes were dotted with nubes, already beginning to go brown because of the lack of rain. I walked Qalba home, downed the day’s fifth cup of coffee, and drove back to the lomas on Calle Pípila, a dirt road that branches off Calle Indepedencia a few hundred meters uphill from the Casa DaviLinda. In the back of the CRV, three small garbage cans and a couple of boxes for packing with nubes. It took me an hour and a half to fill them, discounting time to wipe the blood off my arms from the scraping thorns. I didn’t bother to pick flores de San Nicolás on the loma: they grow in profusion all over our yard! Saturday morning after walking Qalba, Cynthia and I [Ah – Cynthia. I forgot to mention her. A delightful friend of Deborah’s from Portland who had been staying with us in the casita for a few weeks while attending Spanish classes in Oaxaca City] went over to the farm, where Jim and some of his farm crew directed us in the assembly of flower bundles. Kathy, it seems, had absented herself for the weekend. She had obviously been resolute about her previous season’s avowal of “Never again!” After a couple of hours of bunching blooms (gather a handful of nubes, thread a couple of cempasúchiles and a terciopelo, into the center, add touches of flores de San Nicolás for color, tie off, stack on the table; repeat) Cynthia and I walked home. Cynthia went in to the city, and I collapsed for a couple of hours. Later I drove up Pípila on my way to shop at the Bodega Aurrerá, the Walmart subsidiary that apparently never closes. Seven cars, a dozen gleaners, and not one single nube or flor de San Nicolás still to be seen! their version of an overture. We applauded, thanked them with a colaboración, and bid them goodbye. They went down the entrance road, turned left at the gate, walked up Calle Independencia, and turned into our neighbor Alan’s property, and ran through their repertoire again. Full volume. And so forth, all the way up past the Santa Cruz Agencia and school. We could still hear the tubas two hours later. the band blaring, no one flagging, even though it was clear that they had been dancing for hours up and down the village’s streets and that the imps were fueled by adrenaline and most of the adult dancers were half in the bag. The retinue of the lead players included a dozen or so gorgeous young ladies, slutty in their come-hither masks, their jutting bosoms, their fishnet stockings, and elegant boots. All men of course—the comparsas in San Pablo and Santa Cruz are only men—and all clearly relishing their alter egos in drag. The very alluring novia, the bride in the morality play, pulled me into the maelstrom and we danced —a cross between a Texas 2-step and a high-school sock hop from the late 1950s—for what seemed like a half hour but must have been six or seven minutes. Then my lungs gave out, and I panted back to my seat to the whispered kudos of the bearded gents behind the bar. After another half hour of dancing, three women —one of them Cynthia— take baskets filled with candies out into the swirling throng and toss handfuls of candies out over the dancers. They are intended for the kiddy-imps, but it seems that absolutely everyone craves chili-flavored lollipops, fruity hard candies, chocolate covered marshmallows, and rainbow colored chewing gum, so what up until now had been mere melee degenerates into roller derby without rails. Triumphant tail wagging imps hold their prizes aloft for their drag-queen fathers and their grandparents on the folding chairs to admire. Finally one of the trumpets gives a loud blast, and the costumed throng, their camp followers, and most of the spectators surge toward the gate and down the dirt road into the night. The last we hear of them, of course, is a few faint oompahs on the wind. boom sizzle blast of the skyrockets annoying? Did Jim put a kibosh on pyrotechnics? Remind me to look into this. Monday afternoon, this time in bright sunlight, we repeat the whole scene at Jim’s with the Santa Cruz comparsa. This time they showed up an hour and a half after the announced time. But the band made up for it picking up the tempo and the dancers by redoubling their expenditure of energy. For what seemed like hours! After they had gone, after the last wisps of tuba had faded into comforting silence, Jim and Kathy’s employees, twenty or so folks from the expat community and a number of their Mexican neighbors, take what is left of their energy into Jim’s house —Kathy is still traveling— for pan de muertos and hot chocolate. There is mescal, too, and beer, but the chocolate seems to be the most popular drink. Gradually the adrenaline ebbs, there is a long communal sigh of relief, and after a couple of hours the party breaks up. What on earth are Linda and I going to do when Lalo’s Santa Cruz comparsa visits our house at 8:00 Tuesday evening? We’ve sent email announcements to all our friends, in fact, to the entire expat community. And we’ve posted signs around the neighborhood, and invited the numerous folks I regularly meet when walking Qalba. After several conversations with our Mexican neighbors and our veteran expat friends, it is clear that Lalo’s assuring “No, you don’t have to do anything at all,” was specious. At minimum the comparsa and its camp followers will expect chocolate and pan de muertos. And a basket of candy for the kids. And some kind of foodstuffs for the friends and neighbors who will have come to see the comparsa perform. And . . .
We have made a family Muertos altar on the porch. Big portraits of great-grandparents Shulman. Assorted senior Gitlitzes. Bill Stetcher. Valerie. A few of the appropriate flowers, but not many: the whole property is resplendent in sunflowers and flores de San Nicolás. The altar may not be elegant, but it is heartfelt. We miss those folks, and are pleased to have them here with us. Emma Solís will come with her mom, doña Carmen, to help make the chocolate. I buy the necessary supplies. We buy pan de muertos. And a half dozen 3-liter bottles of soft drink. And make several gallons of hibiscus-flavored jamaica. The drill – according to Emma—is to watch for the comparsa and its followers coming up the road and then, after estimating the number, add the appropriate amount of expensive powdered chocolate to the already boiling water. Cynthia and I yank out enough flowers on the slope between the casa and the casita to free up a space for the guests. We set up a drinks table. We’re ready. No we’re not. Yikes!, it is going to be dark and we don’t have any illumination for the designated theater. We turn on all the house lights. They show off the inside but don’t do much for the outside. I hang a power light from the mango tree. We get out our flashlights. Damn, one of the batteries has lost its charge. We plug it in. 6:45. Everything is ready for 8:00. Emma and doña Carmen sit down for a rest. Qalba paces: something is up. The phone rings. It’s Lalo: the comparsa will show up in fifteen minutes. “Can’t you ...?” Too late. The air brings the sound of tubas. In they come, up the road, through the portón, through the aisle of sunflowers toward the casita. Band first; costumed players; retinue of imps and drag-babes. Camp followers. The power light sways in the wind, intermittently illuminating a small section of bare ground between a pile of gravel and a large clump of flores de San Nicolás. The comparsa mills around. The dancing starts. There isn’t enough room for chaos, so the dancers have shuffle in a tight circle, counter-clockwise. The tubas oompah, the trumpets and trombones blare, the clarinets squeak. We have no guests. Lalo tells me that no one in the comparsa has gone to bed yet. Since Sunday! That may explain the lack of structure to the music they are playing in several keys and at least three separate tempos. Emma has brought out the chocolate and pan. It disappears as fast as she can bring it out. I hold my flashlight high. The dancing —by now more like trudging,— lacks, shall we say, verve. Cynthia tosses candy. The imps burrow in among the tall yellow flowers and the clumps of flores de San Nicolás that separate the drive road from our compost pits. There are no guests. The comparsa foreman hits me up for a colaboración, which, despite the fact that we already contributed both through Jim and directly through Lalo when the whole plan was initially launched, I take from my wallet and put into his hand. The music slows. A trumpet gives a weak bleat ... and the dancers march down the road through the portón and on to the next venue, a neighbor’s house just up the road. Emma and doña Carmen and Cynthia and Linda and I begin moving food remnants back into the house. We’ll get the paper and plastic cups and the candy wrappers tomorrow in the daylight. As we sink into our chairs, exhausted, a car pulls up the driveway. Melinda Hansen and Sharon, one of her houseguests. The post mortem: it’s clear that Linda and I misunderstood what was happening. The comparsa wasn’t going to perform at our house, just stop by. They stop by lots of houses, so the neighbors felt no compunction to drop by, and besides, everybody was pooped. The comparsa’s visit wasn’t—except perhaps to us—special. Our expat friends, as exhausted as we by three days of non-stop Muertos hoohah, could barely utter two words in sequence, let alone schlep off to another dance-a-thon, and knew we’d understand. Under similar circumstances, we, too, would have wilted and stayed home. And conclusion number two: though Linda and I had been flirting with volunteering to take over the hosting tradition from Jim and Kathy, we had not thought it through. It is now patently clear that our gorgeous, large property does not have enough level ground to make Casa DaviLinda a feasible Muertos-central.